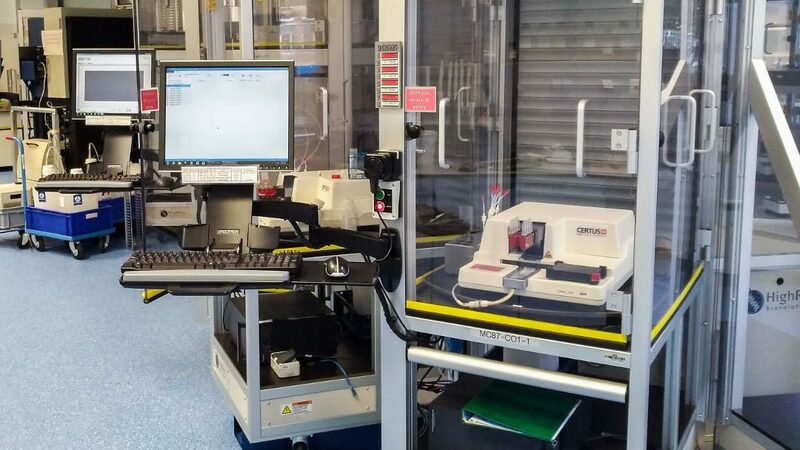 At the Pivot Park Screening Centre (PPSC) a number of different liquid dispensers are used in our fully automated uHTS robotic system as well in the assay development labs to set up the assays. These dispensers are used for adding buffers, enzymes, substrates, reference compounds and cell suspensions to 384 well and 1536 well format microtiter plates, also pure DMSO can be handled by the Certus Flex. In 2015 a wish list was created with options and possibilities for new dispensers to replace a number of dispensers in our automated system. After comparing a number of candidates in our lab on accuracy, precision, repeatability, dispensing speed, minimal volume, different liquids, dead volumes, number of channels, plate formats, plate patterns and the easy to use of the software, the Certus Flex turned out to be the best. For the last two years the Certus Flex dispensers are used very intensively between 10 and 18 hrs a day and didn’t run into a problem yet, besides occasionally a clogged valve. Our assay developers also use the Certus Flex for setting up the different assays and use the syringes to add reagents because of the low dead volumes. Also the willingness of Fritz Gyger AG to listen to the extra hard and software wishes and come with solutions is highly appreciated, e.g. the angled dispensing head was tested and turned out to be a good alternative for adding reagents to adhering cells. The customers who visited our site and asked about the Certus Flex dispensers are positively advised.